I’m a HUGE NFL fan, and I’m a HUGE Jets fan! While talking about football isn’t something you’ll expect me to discuss on my website, I wanted to throw everyone a curveball and touch on a subject close to my heart; The Madden Curse! With the NFL free agency period set to begin on February 27th, and the NFL Pro-Bowl this weekend, now is a good time to reflect on what caused my team to flounder after shocking the world by beating the undefeated Tennessee Titans in week 12. After that, they went 1-4, which should have been 0-5; the Jets had absolutely no business defeating Buffalo in week 15. They are more cursed than the Jets. After displaying his superior quaterbacking ability, Brett Farve, began to display his ability to distribute the ball… to everyone on the field… including the other teams defense. The Jets D, who stopped opponents running game throughout much of the season, could not stop a paper bag. Like other cursed New York franchises (the Mets, Knicks), the Jets failed to claim the AFC East title. All the Jets had to do was win and they could not do that (sound familliar Mets fans?). There are plenty of excuses to go around (Farve was injured, the Linebacking core of the Jets needs an overhaul, the pass denfense needs a lot of help, the Coach was not passionate enough), however there’s only one possible explanation for the Jets downfall this season, Madden! If your unfamiliar with the Madden Curse, its a theory that the NFL player who appears on the cover of that seasons Madden NFL game, will have a horrible season, a season ending injury, or have their career completely changed based on outside influences and screw over your team. Eddie George, Michael Vick, and Sean Alexander are great examples of the influence of the Madden Curse. Take a look at their stats before and after the year they were the cover of Madden, and how their team faired. 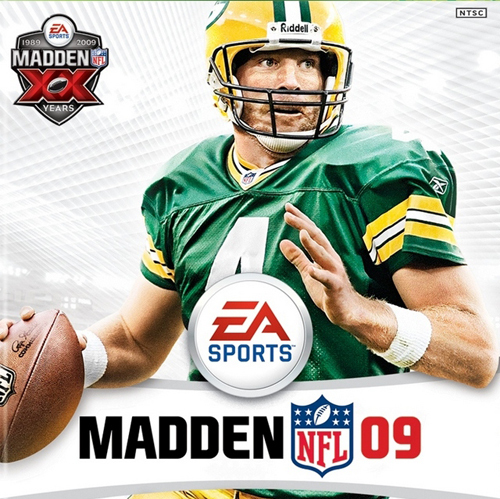 If we remember, Brett Faver graced the cover of the ’09 Madden, in a Green Bay uniform. Brett Farve had retired at the end of last season, after 15 impressive seasons as the Green Bay Packers QB. It seemed the Madden Curse would not affect anyone this year. Brett Farve, then performed a 180 and began to hold the franchise hostage in his un-retirement act. This was the most bizarre scene in football offseason, never has this happened in sports. Green Bay wanted to move on and did not want Brett back, Brett wanted to play somewhere and was practicing with a high school team. Then, the Jets acquired Farve, ousting Chad Pennington (who would beat the Jets and to obtain the AFC East crown). The Madden Curse loomed and while its presence was felt with this bizarre retirement/un-retirement act, it seemed to only affected the Green Bay Packers, being he was wearing a Green Bay Packers jersey. However, EA decided to to allow fans the ability to download and print a copy of a new cover with Brett Farve in a Jets uniform. The curse had been re-applied to the Jets! Why bring up the Madden Curse and Gang Green days after the Superbowl? The answer to this question is ‘Ray Lewis’. The New York paper, Newsday, is reporting Ray Lewis is interested in becoming a member of the New York Jets, and is sponsoring Brett Farve’s comeback to the team. While this came from a recent NFL Network interview and pure speculation, it’s interesting to play with. Lets note that Ray Lewis was on the Madden cover in 2005 and did suffer several setbacks. If Ray Lewis were to join the Jets, it would mean two players are former Madden cover stars and cursed individuals. While Farve is on a hunting trip and has not indicated if he’s going to retire (the speculation is he will), it would be impossible to keep him and acquire Ray Lewis. The Jets would be over the salary cap and would need to shed several bodies. However, there’s plenty of speculation that can be had. Obviously the Madden Curse is a one year phenomena for that player or team, however some questions remain. If two former cursed players appear on the same team, does the power of the curse reactivate? If traded to a new team after a player has been affected by the Madden Curse, does it mutate and form the Ex-Player Madden Curse and destroy a teams hopes? Will Ray Lewis wear green and white? When does the Madden Curse end? Is it when a new player is announced to grace the cover of Madden? Most importantly to Jets fans, will Brett Farve actually retire? All of these questions will remain unanswered, till about August 2009. This entry was posted in Journal and tagged Brett Farve, Football, Madden Curse, New York Jets, NFL, Ray Lewis, Sports. Bookmark the permalink. Many law firms promise high returns for your personal injury case in Las Vegas. We deliver with a team of specialized attorney for your injury case. We work with you until the end. Check us out at http://www.attorneyinjurylasvegas.com/. Master & Sons Plumbing of Richmond effortlessly takes away the cake when it comes to plumbing services. We are currently the top choice of homemakers and housewives of Richmond, VA when they are in need of a plumber for any sort of clog and sewer problems. Aside from plumbing services, we also offer services for water heater installation and repair, toilet repairs, drain cleaning, pipe problems and a whole lot more. That is a really neatly written article. I will be sure to bookmark it and come back to learn extra of your useful info. up is not enough, the carpeted room also contains audio equipment and visual aids. my own blog and want to learn where you got this from or what the theme is called. brown leather jacket with a ribbed fabric waist and three-quarter sleeves. Yes! Finally something about Stood. bookmarking and will be tweeting this to my followers! Wonderful blog and excellent style and design. cardfight vanguard – Trading cards available at Chaos Cards. Many collectable trading cards to be bought online, complete your collection of trading cards now. a perfect method of writing? I have a presentation subsequent week, and I am at the search for such info. I would like to play that game. this looks interesting i love nfl and i almost watch every game . I’m very pleased to find this great site. I need to to thank you for ones time due to this wonderful read!! and other material, is there any other web site which provides such stuff in quality? lot effort you set to make this type of fantastic informative website.